Valour Patriots Football is a proud member of the Manitoba Minor Football Association (MMFA). Ours is a program based on the fundamentals of inclusion, embracing diversity, and ensuring every youth who wants to play is given the opportunity. Our name and logo are tributes to the history of Valour Rd., which Valour Community Centre is named for. After a generation without a minor football program based in Winnipeg’s West End, Patriots Football was established in 2009. Our first season saw 65 players registered at three age levels (Terminator, Atom, and Peewee). In 2012, the numbers grew to 120 players and include all age groups within the MMFA. Through the hard work of our players and coaches, the quality of our teams has steadily improved, and there are no easy games for opposition teams at Patriots Field. On game days, the large crowds of enthusiastic family members, friends, and supporters transform the neighborhood into a busier, and much noisier place! Patriots Football recognizes and acknowledges the strong history of football in West Winnipeg by honoring leaders from its past. The Leo Ezerins Patriot Pride Award, and the Dave Donaldson Defensive Player Award are awarded annually by their namesakes to deserving players. Jimmy Marnoch, GENERAL MANAGER, VALOUR COMMUNITY CENTRE, writes; the history of the Valour Road area of Winnipeg. Valour Road runs north-south thru the West End of Winnipeg MB. Formerly known as Pine Street, the name of the street changed to Valour Road after 3 residents of the street all received the Victoria Cross for actions of bravery during WW1. The West End is one of the oldest neighborhoods in the city, and formed the West End of the old City of Winnipeg before Winnipeg merged together with several other surrounding municipalities. So, in actual fact, there are several other neighborhoods located to the west of the West End, and the West End is actually in the “Core Area” of the new City of Winnipeg. The West End is a largely working class neighborhood, and it is very diverse (home to many Metis Canadians, Indigenous Canadians, and Canadians of European, Asian, and African descent). In addition to the Metis, Indigenous, and Anglo-Canadian families living here, the West End has always been a home to new immigrants as well (Icelanders formed a large part of the population earlier in the 1900’s (side note, the first gold medal in Olympic ice hockey was won by the Winnipeg Falcons – a team made up largely of Icelandic immigrants from the West End), Portuguese and Filipino families began immigrating to the area in the 70’s and still make up a significant portion of population, and more recently many families of African and Middle Eastern origins have settled in the neighborhood). The West End was formerly served by 3 community centres (Clifton, Isaac Brock, and Orioles). 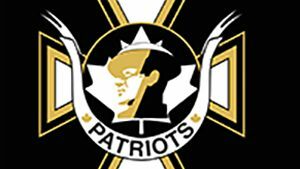 Those three centres merged operations in 2006, and renamed under the banner Valour Community Centre, and the sports teams adopted the name Valour Patriots (logos are attached).